TORONTO, ON., (September 4, 2014) — It's not science fiction anymore. Toyota is putting the future of auto safety technology on display, including environment-mapping systems that can track objects on the road both day and night, 3D information displays that transform the ability to provide road information to drivers, and an advanced driving support system that will be available in the mid 2010s. 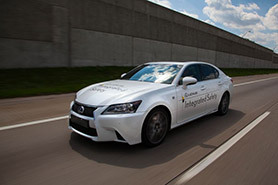 "Toyota’s vision is of a world without traffic fatalities, and these advanced connected and automated vehicle technologies hold the potential to revolutionize automotive safety," said Seigo Kuzumaki, Chief Safety Technology Officer Secretary for Toyota Motor Corporation. "We are committed to bringing advanced active safety systems to market as quickly as possible and will make them accessible to a broad range of drivers." Improved automation through DRCC and LTC enable safer and more comfortable highway cruising to drivers. However, it is important to always engage the most important component of the driving system – the "driver." For that reason AHDA has incorporated a Predictive and Interactive HMI as an integral feature to enable smooth transitions between automated and manual driving. The system provides advance "preview" information to the driver for upcoming settings where limited system support can be expected, predicted based on upcoming road geometry as well as historical sensor performance. These predictions are intelligently generated such that they are only relevant for the particular lane in which the AHDA vehicle is currently travelling. Lane-specific predictions are a result of fusing data from an enhanced map, an automotive-grade global positioning system (GPS) receiver, and sensors such as the forward-looking camera and radar. Toyota’s innovative 3D Heads-Up Display builds on the company’s philosophy that advanced safety technology should work as a "teammate" with the driver to offer a groundbreaking new approach to vehicle interface design. The system provides critical information including vehicle status, traffic conditions and road signs on the front windshield, rendering them in three dimensions without the need for glasses or other accessories.